You have shown me the way... THANKS !!!!!!! It's so great street shot!! I'm glad to see it coz I really like it. WONDERFUL... you are a genius.. Excellent composition,angle and color tones. 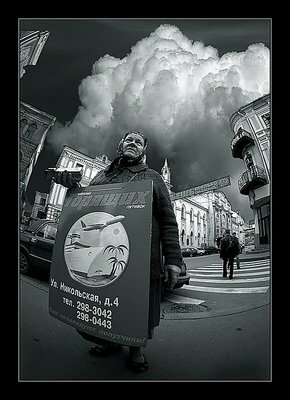 Amazing dramatic sky and old lady made this photo to looks so great. Incredible use of the sky as drama! What a great subject! Just a fantastic and great picture, congrats..
A fish eye lens! Ooooh this is cool. Wonderfull contrast and tones to it too. Yet again stunning work... Perspective is very clever Yuri. Lovely portrait, gives an insight into the subjects life and how they live. as well as a fitting background which adds mood and charecter to the photograph, I hope it didnt rain on the lady. I love street potraits. And you have done a very strong one. Congratulations! Tremendous image. A report in one shot. Could think of a lot of captions for this one! Good eye to see this opportunity! And lucky you, with that sky/thunder cloud! A story in itself. Wonderful tones and contrast. A 7 is not high enough for this one. beautiful view Yuri...? Excellent work! The lady doesn't seem to have enough money to hire a taxi and she is selling airplane tickets to fly into that thick menacing sky. Everything is such a strong statement. Excelent use of wide lense. Its a winner for sure. Your whole Moscow casual portrait series is great. Guess you used a polarizing filter? My eye is drawn down to her left hand, which seems to be gnarled by rheumatism. Poor old grandma. Long days. Great photo in every respect. I love the lighting, contrast & the billowing clouds. These together with the woman's expression sweep the eye toward the uppr right sky. Excellent image!